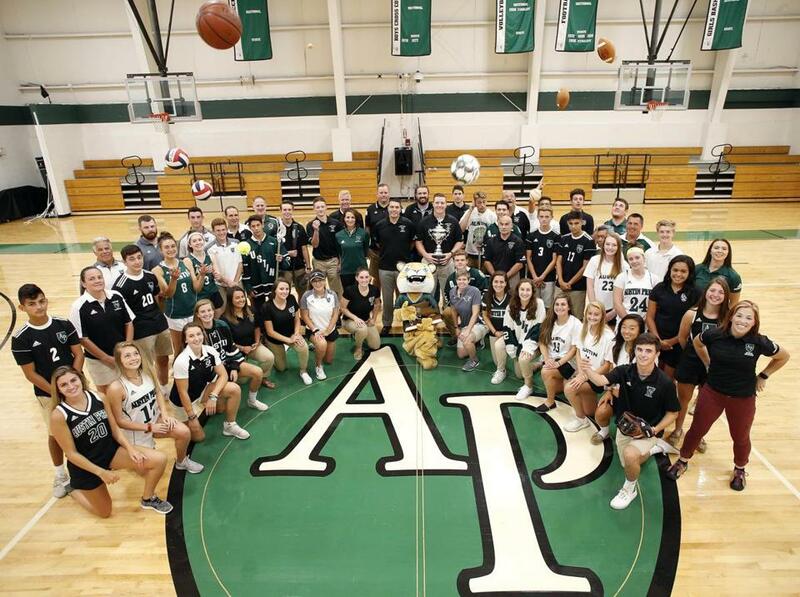 Austin Prep athletes and athletic staff members will look to continue their run of success in the 2018-19 season. READING — Austin Prep is in full construction mode. In a completely rebuilt dining hall (indoor and outdoor seating), a $3 million three-plus month project was completed in the 90-degree temperatures this past week, just in time for Monday’s opening of the 2018-19 academic year. “Down to every nut and bolt,” said Jon Pollard, the school’s athletic director since 2014, with a smile. In the classroom, following Prep’s mission “To inspire hearts to unite, minds to inquire, and hands to serve,” teachers instruct, nurture, and challenge their students for the future. And out on the fields and courts, where the expectations are just as high, the Cougars have built winners across the board. The 2017-18 school year was exceptional. Capped by an astounding 91-16-0 regular-season mark from its spring varsity teams — Frank Sorrenti’s softball squad finished 20-0 and Steve Busby’s baseball nine went 18-2 on the way to the program’s first state championship — Austin Prep won 74.09 percent of its 276 games in 2017-18. And for the first time in its history (the school was founded by the Augustinian Fathers of the Province of St. Thomas of Villanova in 1961, opening to students in 1963), Austin Prep has captured the Globe’s Nason Division 3 trophy, presented to Catholic coed schools. The award is named after Jerry Nason, the Globe’s executive sports editor for 33 years, retiring in 1974. Prep is one of 10 divisional winners in the Globe Scholastic Awards, edging runner-up Central Catholic (72.59), and halting the five-year run of Bishop Feehan. Wellesley (71.84), the Ames Division 2 winner three of the four previous years, moved up to Division 1 (enrollment 1,400 or higher) and captured the Dalton, nosing out Bay State Conference rival Natick (69.70) with an EMass-high 267 total wins. The awards, now in their 46th year, rank schools based on their regular-season win percentage. Scores are compiled and updated daily during the season through the Globe’s database. Complete results are available on bostonglobe.com/schools. “This group has what you are trying to instill in your student-athletes, and on the ball field, and the court, it’s an extension of the classroom here,” said Dr. James Hickey, beginning his sixth year as headmaster. Austin Prep fields 20 varsity programs, plus cheerleading. In 2017-18, 80 percent of the 749 enrolled students on Willow Street competed in at least one sport, and as Hickey noted, many are three-sport athletes. “When Dr. Hickey recruited me, I found that we shared the same vision,” he said. “The school really has made a commitment to athletes,” citing a renovated football/track stadium, a new film room, and an auxiliary locker room. And to attract those student-athletes to campus, Prep targets coaches “with a following,” according to Pollard. “We are a private school, so no one is forced to come here,” he said. Stephanie Wood, a former Northeastern standout who guided the girls’ hockey team to a 21-1-2 record and the Division 1 semifinals last winter, is the women’s director of the Islanders Hockey Club. Second-year boys’ hockey coach Bill Pappas is an assistant skills coach with the Valley Junior Warriors. Bill Maradei is certainly proud of his 25 seasons at Prep as football coach, punctuated by 17 winning seasons and three Super Bowl appearances, “We’ve turned the program around,” said Maradei, who is the state’s winningest Catholic football coach (265-147-4), including his 14 years at the former Dom Savio. He already has announced that he will step down at season’s end. ■ Dalton Division 1 — In its first season in D1, Wellesley (71.84) was dominant in the fall (91-26-6). The boys’ and girls’ cross-country teams combined for a 15-1 mark and girls’ swim team was 11-0. ■ Ames Division 2 — In registering 80-plus victories in all three seasons, Hopkinton (69.51) edged Hingham (69.02), Masconomet (67.99), and Duxbury (67.85). The Dalton D3 winner in 2012, the Hillers earned their first Ames. ■ Dalton Division 3 — The Ames D4 winner last year, Old Rochester (73.76) moved back to Division 3 with an enrollment increase and rode stellar seasons from golf (16-0), girls’ soccer (17-1), girls’ basketball (18-2), and girls’ lacrosse (20-1) to the title. ■ Ames Division 4 — In the closest competition, West Bridgewater (68.01) narrowly beat out Norwell (67.60) thanks to two more total victories, 192-89-5 to 190-89-8. The girls’ basketball team was 20-0. ■ Nason Division 1 — In the City, Latin Academy (58.03) finished strong in the spring (58-31-0) to top runner-up Charlestown (53.98). The Dragon boys’ volleyball team (14-4) won its third straight Boston City title. ■ Nason Division 2 — St. John’s Prep (76.41) registered the highest percentage among all schools to capture its second straight Scholastic win, topping Catholic Conference rival BC High (73.90). The boys’ soccer team (15-0-3) advanced to the D1 semfinals and the ski team was 12-0. ■ Singelais Division — In earning its first trophy since 2004, Ursuline (66.27) defeated Notre Dame-Hingham (62.69). The swimming/diving squad was 7-1 in the fall, girls’ basketball finished 13-7 in the winter, and golf 13-4-1 in the spring. ■ Markham Division 1 — Blackstone Valley Tech (67.13) extended its run, finishing ahead of Whittier (60.34) for its seventh crown in 11 years. An unbeaten regular season for the football team spearheaded a 73-29-10 fall. ■ Markham Division 2 — Old Colony (58.61) won its first title thanks to a 15-5 season from the girls’ basketball team and smashing success in the spring from girls’ lacrosse (16-3), girls’ softball (13-7), and baseball (14-5). LARRY AMES: Ames was assistant sports editor/schools at the Globe from 1979 to 1994. ERNEST DALTON: Dalton was the Globe’s high school editor from 1938 to 1970. He died in 1971. JERRY NASON: Nason was the former executive sports editor of the Globe. He died in 1986. NEIL SINGELAIS: Singelais was the Globe’s high school sports editor from 1970 to 1979. He died in 2002. WALTER MARKHAM: Born and educated in Lowell, Markham was president and treasurer of the American Vocational Association for four years and was responsible for initiating the concept of regional vocational and technical high schools in the state.